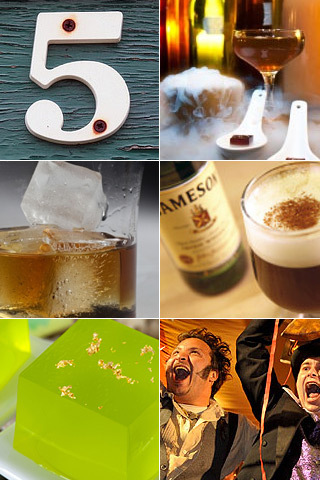 This week’s drink links include a look at the Top 10 Cocktails in Toronto, Buffalo Trace’s quest for the perfect bourbon, Irish Whiskey drinks, a fun jelly shot recipes for St. Patrick’s Day and the winner of the Cocktail World Cup. NOW Weekly searched the cities best bars to find http://www.nowtoronto.com/food/story.cfm?content=179442“>Toronto’s tastiest mixes. From the Log Cabin at The Comrade to The Mad Man at Bar Chef, here are the best cocktails in Toronto, and the bartenders behind them. The folks at Buffalo Trace Distillery in Frankford, KY aren’t just sitting back on their laurels. For the past 20 years they have been working on Project Holy Grail, in a quest to unearth the variables in whiskey making and chemical makeup to produce the “perfect” whiskey. You don’t have to limit yourself to green beer on St. Patrick’s Day. This Globe & Mail story features several cocktails featuring Irish Whiskey picked from the Complete Home Bartender’s Guide, a staple of the Madtini cocktail book library. What could be more fun that a delicious green cocktail this St. Patrick’s Day? How about that same cocktail as a Jelly Shot? Jellyshot Test Kitchen is serving up a recipe for a Lucky-tini Jelly Shot using vodka and Midori watermelon liqueur. Team Italy bested six other crews of bartenders to take the title at the 42BELOW Cocktail Word Cup last weekend in Queenstown, New Zealand. Their drink the Elixir of Love, a mix of pineapple, lavender vodka, limoncello, raspberry liqueur and Fernet Branca helped them win the finale and the title. 5 image in collage by Leo Reynolds used under CC license.